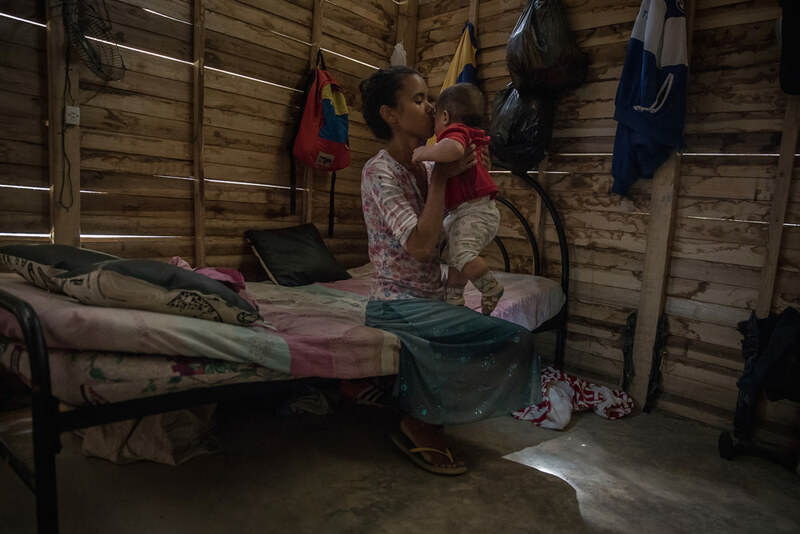 The story of three Venezuelan mothers that crossed into Colombia so that their sick and recently-born children could receive medical attention reflects the serious public health crisis that Venezuela is currently facing. On the 16th of November 2017, Freidermar Martinez and Josue Garcia, two Venezuelan citizens, crossed the Simon Bolivar bridge into Cucuta, Colombia carrying a crying Jhosue Neftali in their arms. For nearly two full days of their travels they had to resort to eating rice with mayonnaise: the only products that remained from the box of food sold by the Venezuelan government. Jhosue, now six months old, was their motivation for emigrating. His mother gave birth in the Doctor Plácido Daniel Rodríguez Rivero Central Hospital, in the central-western state of Yaracuy. He arrived in a state all too common in Venezuela: underweight (at 2.3 kilos, 200 grams under the normal weight for a newborn established by the WHO), and suffering respiratory failure and meningitis, an immuno-preventable disease the Venezuelan government has not bought the vaccine for since 2015. His mother (18 years old) and father (23 years old), two peasants from a rural community in midwest Venezuela, did everything they could to get him the treatment he needed. They had to cover the cost of blood screening every three days, because the hospital didn't have reagents, and they quickly found themselves unable to keep up. According to the Venezuelan Health Alliance, since 2016 the Expanded Programme of Immunisation has been dealing with a shortage of vaccinations for pneumococcus, influenza, and rotavirus. - Freidermar Martinez kisses her six-month-old son Jhosue, who was born underweight in Venezuela and contracted meningitis. Josue, Freidermar's husband, lost his job at the same that Freidermar became pregnant. They had been married for a year, and although they had planned for the pregnancy, they had not planned for either unemployment or the country's hyperinflation. According to figures from the Living Conditions Survey (known as Ecovi), carried out by three Venezuelan universities in response to the scarcity of official statistics, the economic crisis in the Caribbean country has left more than 80% of the population in poverty. It wasn't an easy pregnancy. Freidermar could only start going to check-ups when she was already five months pregnant, by which time she was at risk of pre-eclampsia, malnutrition, and suffering from a vaginal infection she could not control. Although Josue found work after his son was born, the salary wasn't enough to give Jhosue the medical and nutritional attention that an underweight child needs. The situation deteriorated further each day. “We were so stressed out. If we bought formula milk we didn't have any money left for anything else. I looked like Mary Magdalene.” Jhosue cried day and night out of hunger, just as he cried on November 16th when his parents decided to cross the bridge. The sun was shining fiercely as Freidermar and Josue left Venezuela for the first time in their lives. Although they didn't have a single peso on them, they thought it suspicious when a man approached them and offered to buy Freidermar's hair, which grew down to her waist. —“Should I do it?”— she asked Josue fearfully. - Some of the children displaced by the humanitarian crisis play in El Mirador neighborhood in the eighth municipality of Cucuta, where their parents arrived looking for a better future. The man gripped Freidermar's hair tightly and cut it close to the scalp. Around them dozens of Venezuelans passed by with heavy suitcases, bags, and pillows. Frei was left almost bald but had earned 30,000 Colombian pesos, which they used to travel to the accommodations where her brother-in-law and his wife were staying. Jhosue's fever persisted, as did his scabies (a highly contagious skin infection), but they still lacked the money to take him to the hospital. With her baby in her arms, Freidermar, a dark-skinned and thin woman, 1.50 metres tall and with an expressive face, began selling lollipops on the street. “Let's be clear: that's like going out to beg,” she tells us from the house in the neighborhood of Brisas del Mirador in Cucuta, where she lives today. Her short hair is pinned up with a few bobby pins. At a traffic light where she was asking for food or money, she was given a stroller, a baby chair, and a pot of milk. “I was so happy”. A week later, when it looked as though it might rain, Jhsoue caught the attention of a driver, who for weeks had been covered head to toe in sores from the scabies. “Take these 10,000 pesos, get in a taxi, and go to the hospital,” the man told her. Frei didn't think twice. She took a taxi to the Erasmo Meoz University Hospital, Cucuta's most important hospital, where they slowly managed to heal him. Frei now lives in a house that reminds her of her own, although she lives with another 11 people. 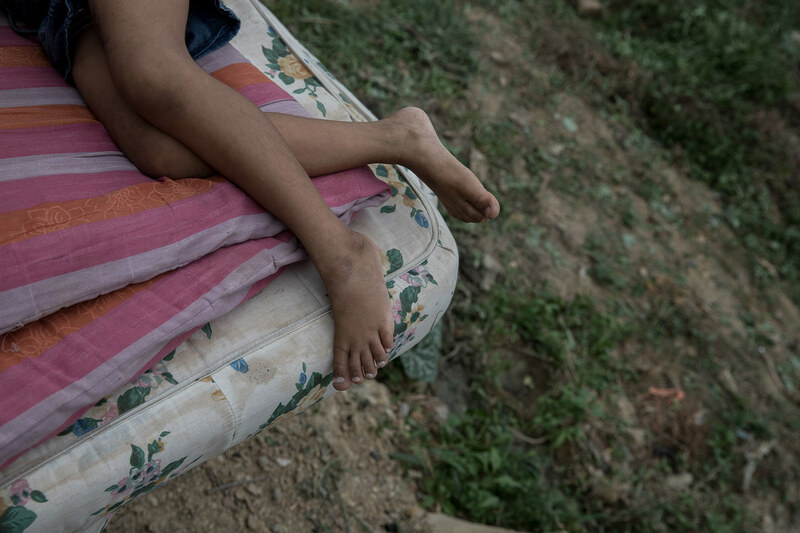 “I dreamt that my son could have a room of his own he could enjoy… Still, things are going well for me here because my child is okay.” In Colombia she dreams of living in the countryside. She wants to be a professional in the agricultural sector and has already begun studying. She would like to be able to plant crops and keep a large garden—but she knows that these are just dreams for now. 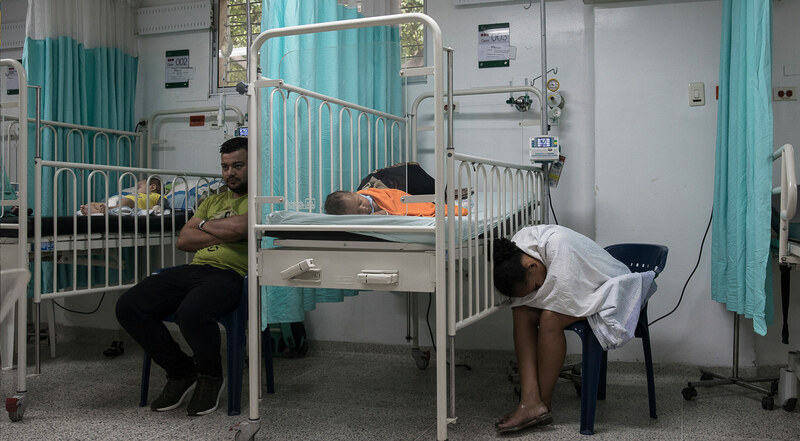 60% of the paediatric patients in the Erasmo Meoz University Hospital in Cucuta are Venezuelans arriving with cases of malnutrition, diarrhoea, meningitis and leukaemia. The Erasmo Meoz University Hospital in Cucuta takes it name from a Colombian doctor who studied medicine in Venezuela in 1885. This institution is the reception centre for Venezuelans migrating to Colombia for health reasons. According to the director of the hospital's emergency department, Andres Eloy Galvis, in the last two years they have attended to at least 11,000 Venezuelan patients. 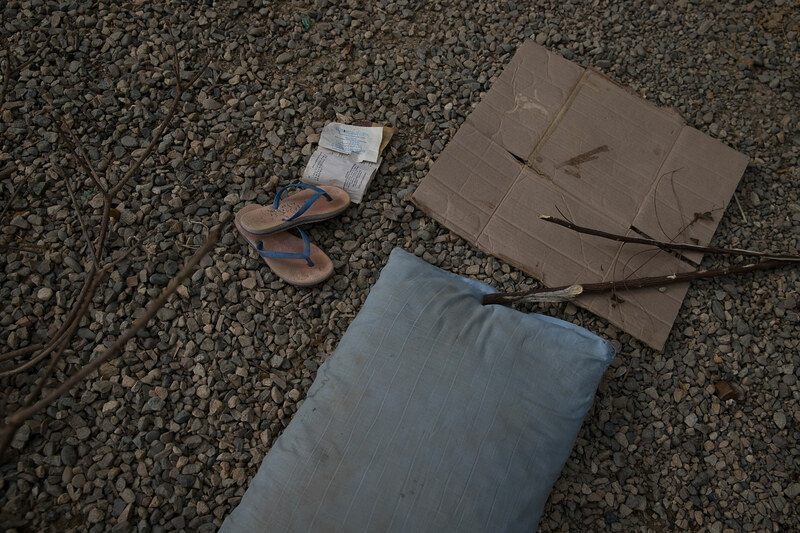 Amongst these there have been hundreds of children arriving with serious health conditions. In the emergency paediatric department of the hospital at least 60% of the patients are Venezuelan. Doctor Albert Abisai Cova, a Venezuelan paediatrician who studied in the Western University (UDO) in southern Venezuela and who has been at the hospital for two years now, explains that the Venezuelan children they see are diagnosed primarily with malnutrition, pneumonia, bacterial meningitis, leukaemia, and diarrhoea. Although the Colombian government has given instructions that the migrants are to be attended to, the hospital is struggling to keep up. Besides the number of patients, it is also facing financial difficulties: the hospital is currently in 240 billion pesos worth of debt, of which 10 billion, as of March, was a consequence of the medical attention given to Venezuelans. According to the records, of the 81 patients hospitalised on 6 May, 16 were migrants—and of the nine which were in intensive care, four were Venezuelan. There are many reasons for their arrival; however, one of the most common cases seen is that of Jhosue: underweight newborns with respiratory problems who need to be attended to in intensive care units, which in Venezuela are in a state of collapse. The Venezuelan children are diagnosed primarily with malnutrition, pneumonia, bacterial meningitis, leukaemia, and diarrhoea. - The Erasmo Moez University Hospital in Cucuta has attended to more than 11,000 Venezuelan patients in the last two years. 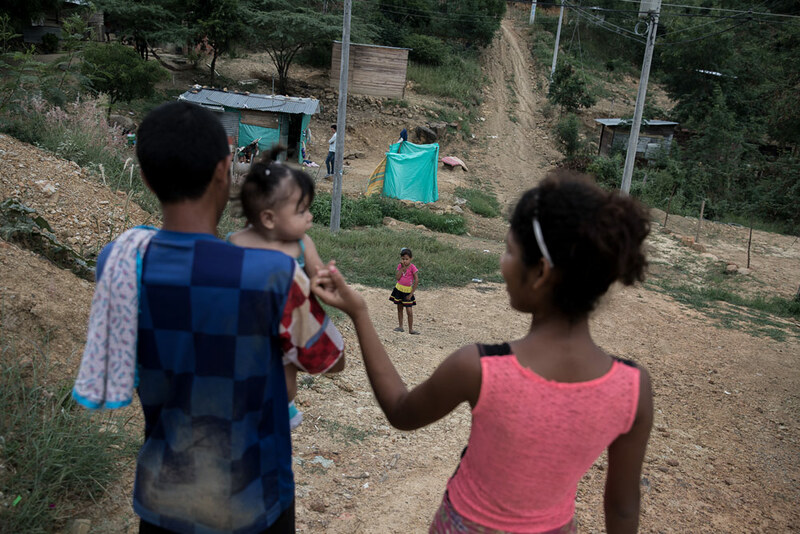 It was in Yaracuy, the state from which Jhosue's mother Freidermar comes, that President Nicolas Maduro promised that “even if the price of oil falls to zero, our children will have everything guaranteed for them: health, education, and well-being”. He gave the speech during the reinauguration of the Neonatal Paediatric Unit of the Niño Jesús Hospital in San Felipe, where six years later the neonatal equipment has been left in a state of disrepair. According to a piece of investigative journalism carried out by the Venezuelan Institute of Press and Society (IPYS) together with the news portal El Pitazo, children like Jhosue can be forced to wait weeks before being attended to in a functioning incubator, because 70% of the neonatal equipment in this hospital, purchased through an agreement with Argentina, is damaged. 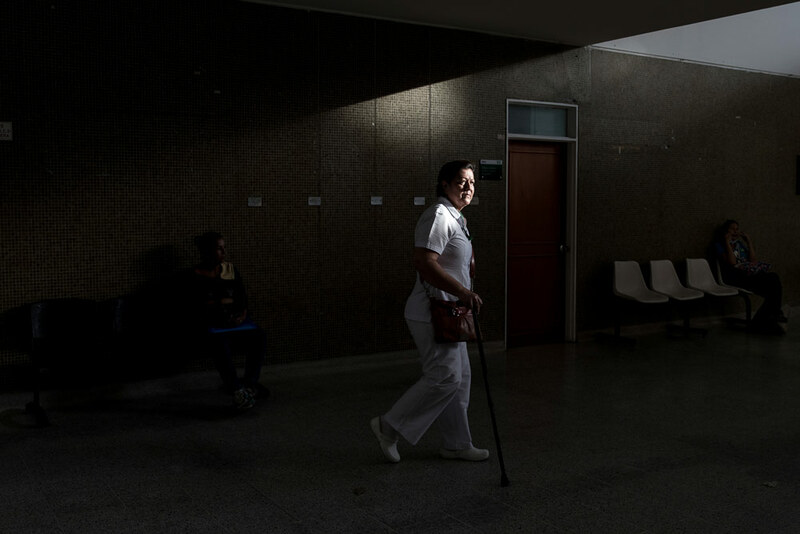 Although Venezuela is one of the countries that spends the smallest percentage of its GDP on health, the collapse of the health system was held back by the work of a number of highly trained doctors, together with solid, advanced health infrastructure. Nevertheless, the acceleration of the crisis - now broadly considered a humanitarian crisis – was inevitable under an economic system as inefficient, corrupt, and bureaucratic as Venezuela's, leaving the country heavily indebted to pharmaceutical companies, and suffering a shortage both of basic medicines like penicillin and of medical professionals, many of whom have migrated to other countries. This situation has led to the reappearance of diseases that were considered eradicated in Venezuela such as diphtheria, polio, and measles. Meanwhile, malaria has become endemic in the south of the country. A similar state of affairs is now being seen in Cucuta, Colombia as well. In the surrounding areas of the border city, billboards paid for by the Colombian Ministry of Health warn in large letters: “Migrants, if you are showing the following symptoms please consult a doctor”. They form part of the ministry's campaign against measles, which has begun arriving from Venezuela. It is Venezuela, the Pan American Health Organization reports, that is responsible for 81% of the continent's reported cases of the disease. 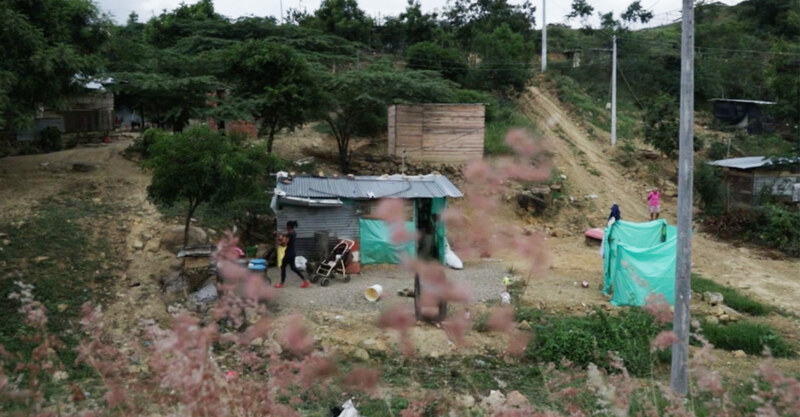 The Brisas del Mirador neighbour in the eighth municipality of Cucuta has received hundreds of Venezuelans that have crossed into Colombia to escape the humanitarian crisis in their country. Zurishaddai is a biblical character, who appears in Numbers 2:12-22. It is also the name given by Yosmary Garcia to her first child, who died when he was just three days old. He was born underweight and with impaired fetal growth—at least that's what they told her in Venezuela. After that first loss, the doctors were clear with Yosmary: she could not get pregnant again, and if she did then she would be putting her life at risk. Three months after her caesarian section, however, she found herself pregnant once more, in high risk conditions and in a state of malnutrition. Her daughter was born after 37 weeks of pregnancy in the same hospital in Yaracuy in which Freidermar had been attended to: Doctor Placido Daniel Rodriguez Rivero Central Hospital. She decided to name her second baby Zurisadai as well. The rate of infant mortality doubled in Venezuela between 2015 and 2016, according to official figures. In 2016, 756 pregnant women died, almost double the number from the year before. When Zurisadai was two months old, Yosmary was unable to produce enough milk to feed her, and she was told she should begin using goat's milk. Formula milk was not option. Increasingly scarce, formula now costs five times the minimum wage, which is a wage earned by less than 20% of the population. “She was really thin and I got scared. She was always crying out of hunger,” says Yosmary. That was when she decided to migrate. 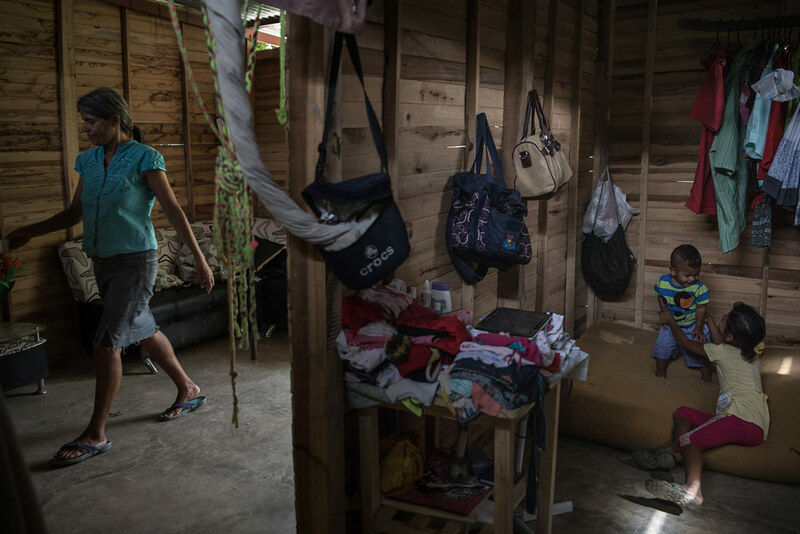 - Yosmary Gaarcia with Zurisadi inside the shack she shares with her family in the Brisas del Mirador neighbourhood of Cucuta, Colombia. 23-year old Maria Isabel Lazaro tells a similar story. She too migrated to the same neighbourhood in order to save one of her four children: Juan, the smallest of the group. She arrived in Cucuta on November 14, 2017 with Juan and Yordi, and a few weeks later returned to Venezuela to collect the other two. When she sought medical help in Hospital Erasmo, the children were in such a critical state that the Colombian government intervened – through a family care programme – and put the children in the care of a surrogate mother until their health stabilised. 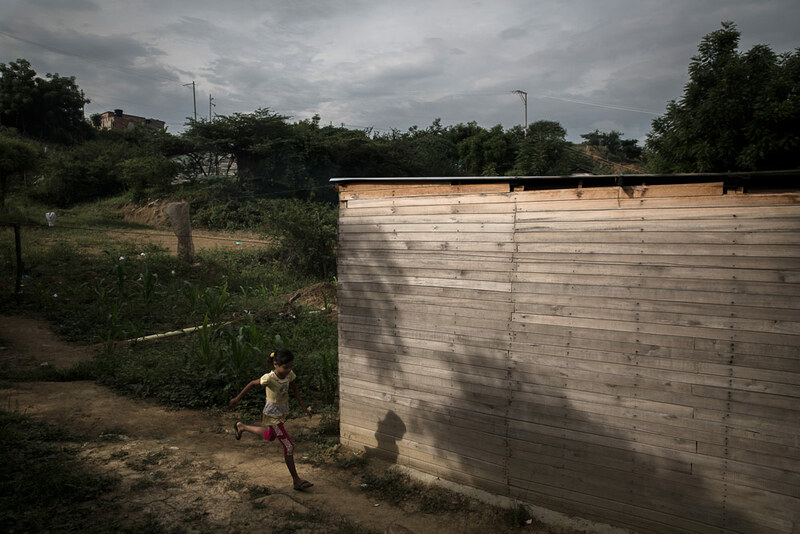 Now the four play together in the El Mirador neighbourhood of the eighth municipality of Cucuta, near a 5x5 metre shack made of plastic, with a zinc roof, wooden walls and a wooden floor, in which eight other people live. - Yosmary Garcia, 25-years-old has brought her whole family to Cucuta from Yaracuy. 11 people live in a shack they take care of in the El Mirador neighbourhood. 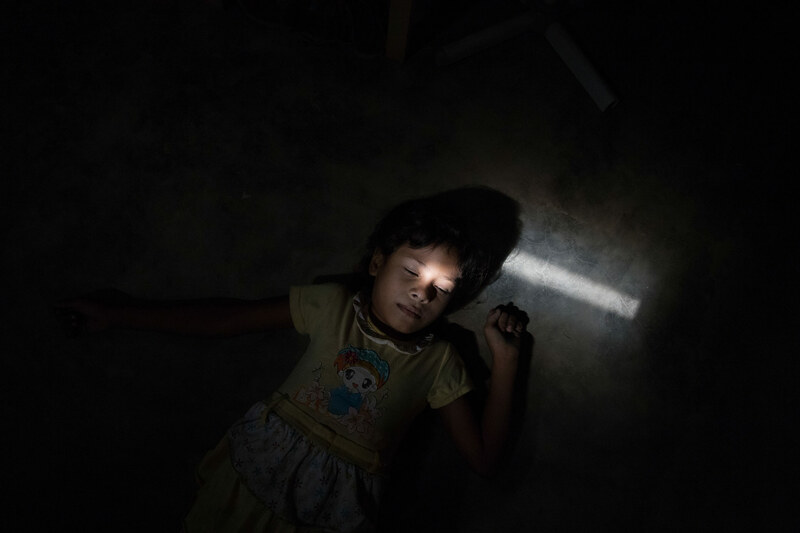 - 56.3% of the people that crossed into Colombia between April and May in 2018 did so for health reasons, highlights a report co-published by the Jesuit Refugee Service. In Venezuela, Maria Isabel had lived in Perija, Machiques, in the state of Zulia. There she began to notice that “Juan's skin was wrinkled like an old man's, and he was thin. People said he looked as if he had died or had had a spell cast on him”. - Maria Isabel's four children, including 6-year-old Maryorie Paola, were handed over to a surrogate mother for four months, as part of the Family Welfare programme. In Cucuta, Juan's future is still uncertain, though far less so than in Venezuela. Although there are international human rights instruments that explicitly recognise guarantees relating to the health of migrants (such as Resolution 61.17 on the Health of Migrants, approved during the World Health Assembly, or the Global Compact for Safe, Orderly, and Regular Migration, promoted by the United Nations), disinformation and fear of deportation prevent many mothers from looking for help. In March 2018, the Inter-American Commission on Human Rights (CIDH in its Spanish acronym) adopted Resolution 2/18 on the forced migration of Venezuelans, which establishes a number of recommendations to ensure governments act in the face of the unprecedented levels of migration on the continent. One of the CIDH's many concerns is the right to health in the face of the numerous human rights violations occurring in Venezuela. A recent report on Venezuelan human mobility, carried out by the Jesuit Refugee Service and the Catholic University of Tachira between April and May 2018, shows that 56.3% of the people crossing over into Colombia do so for health reasons. This panorama, however, is either unknown or wilfully ignored by the Venezuelan authorities, which maintained in the 11th Ministerial Meeting of the Non-Aligned Movement held last May that there was no humanitarian crisis in Venezuela. They signalled that the health problems the country faced were a product of an international embargo that prohibits the purchase and arrival of medicines. Freidermar, Maria Isabel, and Yosmary know that this is not true. They also know that what lies ahead will not be easy. The International Monetary Fund (IMF) calculates that by the end of 2018 the rate of inflation in Venezuela will reach 13,864%, giving it the highest rate in the world. Despite their desire to return, this makes going back to Venezuela ever less likely for these three mothers. 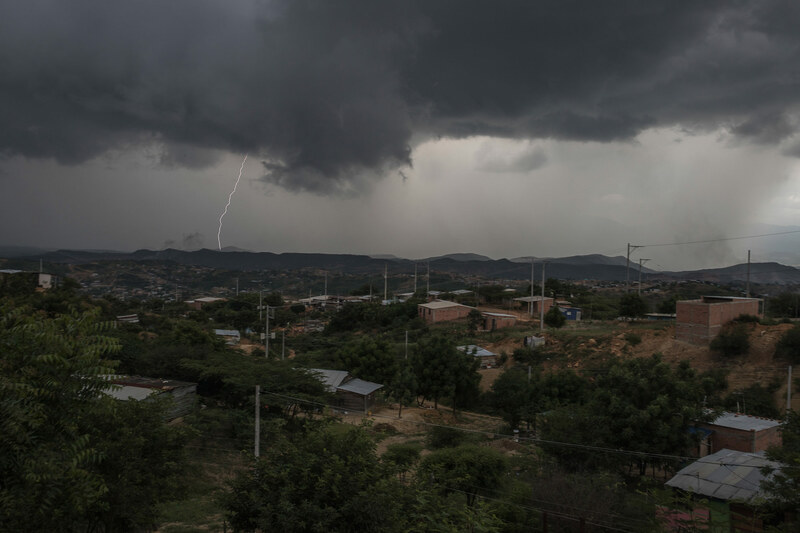 According to the Jesuit Refugee Service and Catholic University of Tachira report, only 13% of Venezuelan migrants can imagine returning to their country. Nevertheless, and though their children are not yet completely healthy, the three affirm that the sacrifice has been worth it. At least now their children are not starving. And that is worth everything.